According to estate agents the number of buyers that are chasing each home that comes ontot he market has risen to an all time high of eight. According to estate agents the number of buyers that are chasing each home that comes ontot he market has risen to an all time high of eight. According to agents the number of buyers chasing the same property is indicative of the number of properties available to buy and is the main driver for the rise in house prices. The average price in England and Wales hit £255,000 which is an increase on Last July’s peak of £2,500. 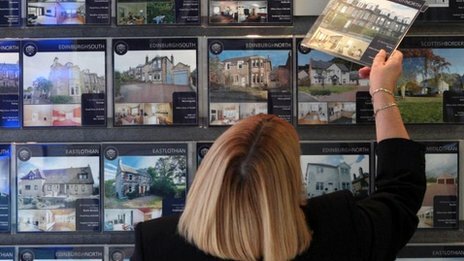 The average house price in London is now at a record level of £552,000 and shows no signs of eaSign Up as lots of buyers chase too few properties. Agents are hopeful that the spring market will bring lots of sellers to the market which may ease the pressure on prices but this will require a lot of new properties to come onto the market. Transactions for property purchases increased in February compared to the same period last year as mortgages to first time buyers increased by 13% compared to the same period last year. There are fears that the property market will heat up over the spring and summer months as buyers scramble to get onto the housing ladder. In another sign that the market is continuing to grow as building societies and banks advanced more that £15bn last month. This figure was up from the £10.7bn in the same period in February 2013. Whilst the governor of the Bank of England will not want the property market overheating he will not want to start taking measures that may choke off the economy at this early point in the economic recovery. It would seem that first time buyers are unperturbed by the high prices and are refusing to move outside of London which will fuel prices further.